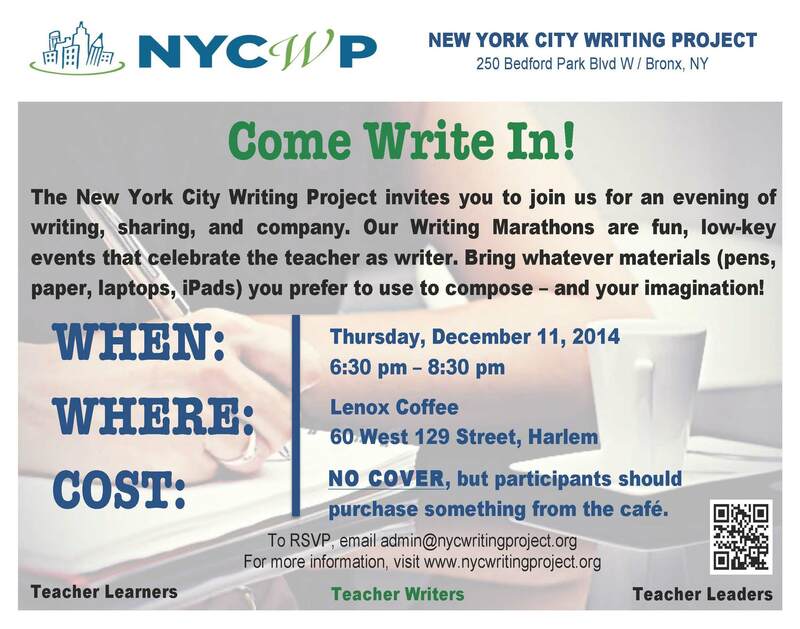 The New York City Writing Project will host its winter Writing Marathon on Thursday, December 11, 2014 from 6:30 pm – 8:30 pm at Harlem’s Lenox Coffee. While there is no charge to participate in this event, participants are strongly encouraged to make a purchase from the cafe, which serves pastries and small plates in addition to coffee, tea, beer and wine. Writers of all levels are welcome! Bring whatever materials you use to compose (pen/paper, laptop/iPad, sticky notes, wood carving tools, etc), a sense of enthusiasm and your creativity. We will write together, share a little, write some more, and share some more. The café is open until 10:00, so participants are free to linger to catch up with old NYCWP friends or chat with new ones.